A dead father is a lost gift, but they leave special memories behind, irrespective of whether they died young or they lived long. 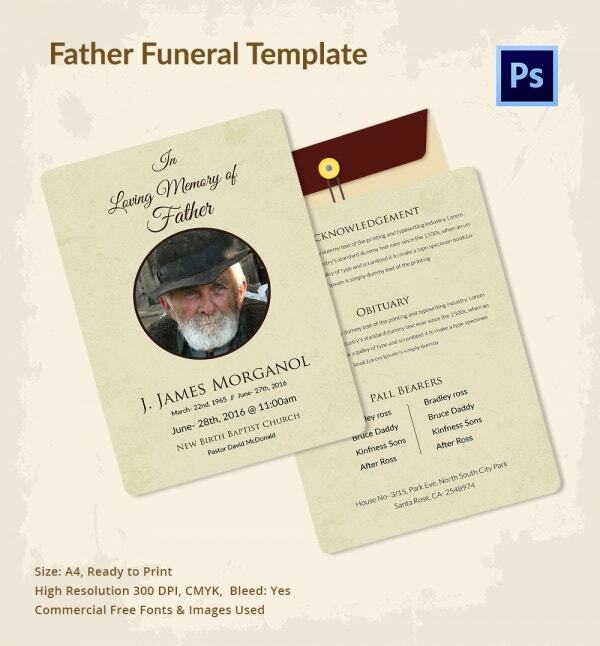 To pay them their last respect, you can use the funeral templates for fathers. There are things you could write on this document but it is best to keep it to the most important ones. The preliminary reason for designing the funeral templates is to save you time so that you don’t have to spend a lot of time and effort on designing the template from scratch. 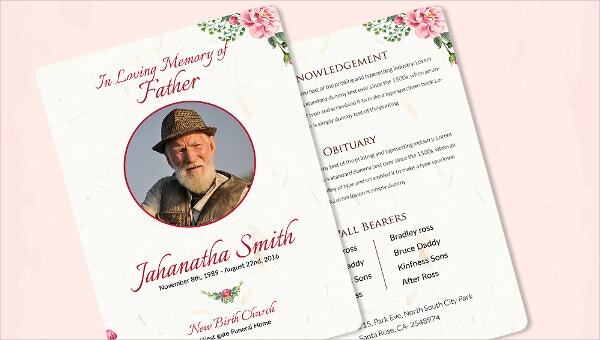 This template is designed to suit your funeral invitation needs. You can write a custom funeral message to the target audience and then distribute the message to as many people as possible. 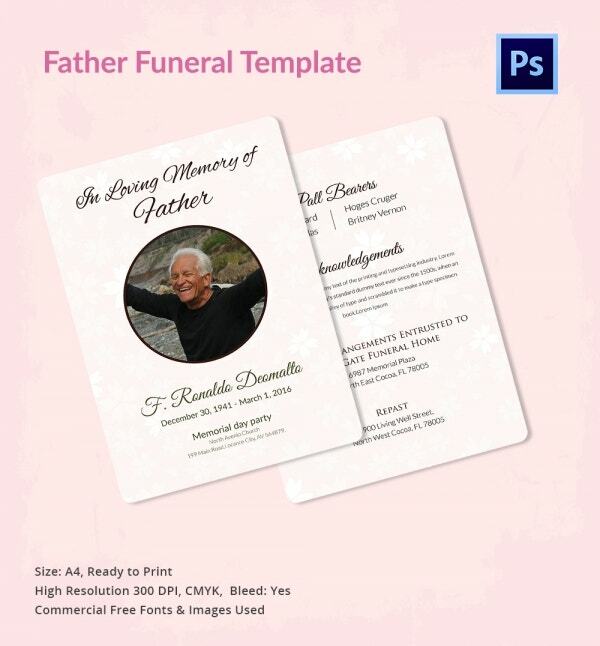 If you are looking for a template that can help you create a funeral program, this will definitely be the best one. It is easy to edit and simple to customize, so it should not take you long to get the program ready. One of the main things you can do with this template is to create a funeral order of service. The order of service will help to run the funeral event from start to finish without any trouble in between. Instead of spending too much time designing an obituary template, use this one. It is a high quality, CYMK color template. It is easy to edit and ready for print. You can edit the template in Photoshop. If you would like to send funeral prayer requests to families and friends, this will be the best template to use. The template is almost always easy to edit, which means you can customize the content easily. > Who Uses the Template? The primary target of the template are the family members who have lost their fathers. A mother who has lost her husband can use the template to spread the information about the death of her husband to friends, colleagues, and related family members. The purpose of spreading the information about the death of a father is to make sure that every person related to the dead knows that he/she is no longer alive. It helps to create awareness in a way rumors never will. You can also see Mother Funeral Templates. 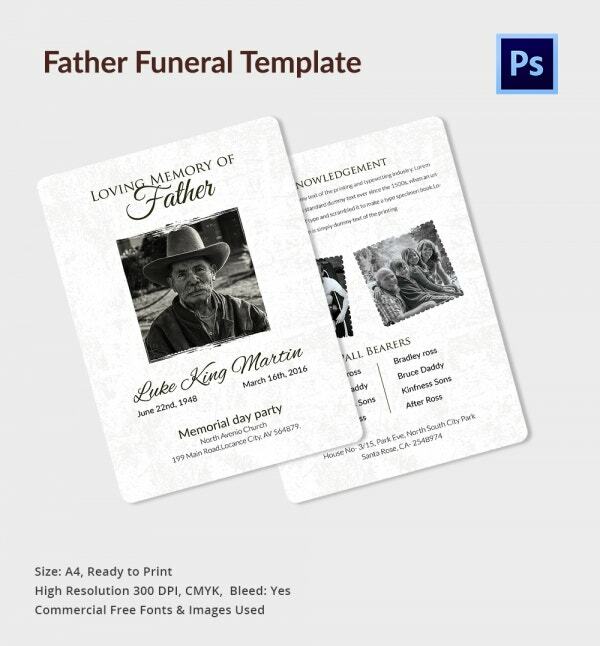 Funeral templates for fathers are important communication documents designed to help different people to spread the information about the death of a father. An employer can use the template to send a death notice to the family of the deceased, the family that just lost a dad can write to an employer to inform the boss about the incident, and friends can write to friends to sympathize and show their condolences for the loss of a precious life. Overall, being able to download the template means the ability to save time and money. The death of an old father is a great invention of life. As you use this template to welcome people to come and take part in the departure of the old man, always remember that the purpose of the document is to gather as many people as possible to come along and be part of the funeral event.